Cement (commonly Portland cement) as well as other cementitious materials such as fly ash and slag cement. Aggregate (generally a coarse aggregate such as gravel, limestone, or granite, plus a fine aggregate such as sand). “cresco”( to grow).Concrete solidifies and hardens after mixing with water and placement due to a chemical process known as hydration. The water reacts with the cement, which bonds the other components together, eventually creating a stone-like material. Concrete is used to make pavements, pipe, poles different structures, foundations, brick/block walls and footing for gates, fences and poles. Portland cement is the most common type of cement in general usage. It is a basic ingredient of concrete, mortar, and plaster. Fine and coarse aggregates make up the bulk of a concrete mixture. Sand, natural gravel and crushed stone are mainly used for this purpose. Recycled aggregates (from construction, demolition and excavation waste) are increasingly used as partial replacements of natural aggregates, while a number of manufactured aggregates, including air-cooled blast furnace slag and bottom ash are also permitted. 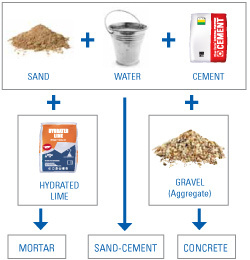 Combining water with a cementitious material forms a cement paste by the process of hydration. The cement paste glues the aggregate together, fills voids within it, and allows it to flow more easily. Less water in the cement paste will yield a stronger, more durable concrete; more water will give an easier-flowing concrete with a higher slump. Chemical admixtures are materials in the form of powder or fluids that are added to the concrete to give it certain characteristics not obtainable with plain concrete mixes. Slow the hydration of concrete, and are used in large or difficult pours where partial setting before the pour is complete is undesirable. A typical retarder is sucrose (C12H22O11). add and distribute tiny air bubbles in the concrete, which will reduce damage during freeze-thaw cycles thereby increasing the concrete’s durability. However, entrained air is a trade-off with strength, as each 1% of air may result in 5% decrease in compressive strength.